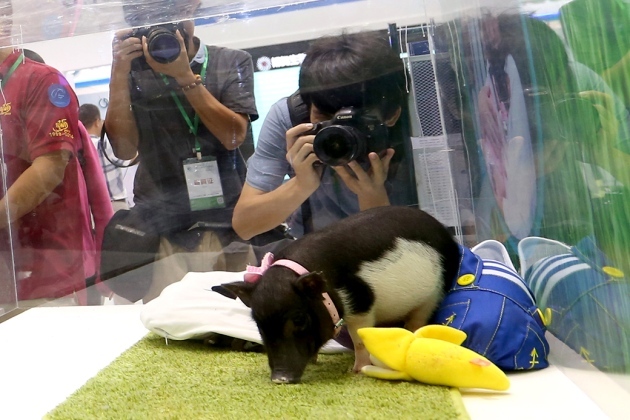 BGI, the genomics institute in Shenzhen credited with a number of breakthroughs in genomic sequencing, is applying its expertise on making tiny pigs for pets. According to Nature.com the pigs will weigh about 15 kilograms when they mature. At the [Shenzhen International Biotech Leaders Summit in China] the institute quoted a price tag of 10,000 yuan (US$1,600) for the micropigs, but that was just to "help us better evaluate the market”, says Yong Li, technical director of BGI’s animal-science platform. In future, customers will be offered pigs with different coat colours and patterns, which BGI says it can also set through gene editing.